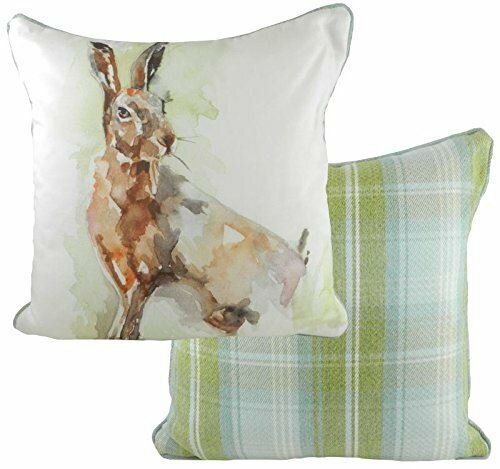 Artist and Designer Jennifer brings sophistication to the Fauna of the Sussex Downs with these superb watercolour paintings to which luxurious Stirling check back and piping is added. Lovingly handmade in Staffordshire, England. Material: Front: 97% Cotton, 3% Linen. Reverse: 100% Polyester. Approx. size; 43cm/17". Dry clean only. Evans Lichfield are a member of SEDEX and have technical and ethical audits carried out on their factory on a regular basis. Artist and Designer Jennifer brings sophistication to the Fauna of the Sussex Downs with these superb watercolour paintings to which luxurious Stirling check back and piping is added. Lovingly handmade in Staffordshire, England. Material: Front: 97% Cotton, 3% Linen. Reverse: 100% Polyester. Approx. size; 43cm/17". Dry clean only. Evans Lichfield are a member of SEDEX and have technical and ethical audits carried out on their factory on a regular basis. If you have any questions about this product by EVANS LICHFIELD, contact us by completing and submitting the form below. If you are looking for a specif part number, please include it with your message.